Your estate plan should be the most important set of legal documents you create and execute over the course of your lifetime. It should help protect you and your assets throughout your lifetime as well as determine how those assets will continue to provide for loved ones after you are gone. 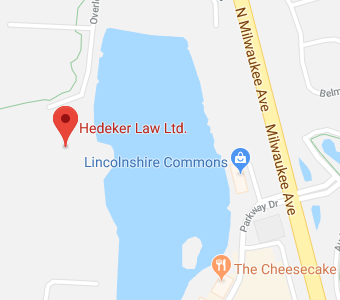 At the Waukegan, Illinois law firm of Hedeker Law, Ltd. We understand the importance of your estate plan as well as your choice of attorney to assist you in the creation of your plan. Originally recorded as Riviere du Vieux Fort (“Old Fort River”) and Wakaygagh on a 1778 map by Thomas Hutchins, the town that would eventually become known as Waukegan would not be called that until the middle of the 19th Century. Before that, the French trading post and Potawatomie Indian settlement was also known as “Small Fort River” and “Little Fort.” During its early days, Waukegan was also known as an abolitionist community. The small settlement didn’t really begin to grow until the arrival of Washburn & Moen, a barbed-wire manufacturer, in 1891. The arrival of the manufacturing company spurred the need for workers. That, in turn, caused significant immigration – primarily from Sweden, Finland, Armenia, and Lithuania — into the area along with land speculation. By the early part of the 20th Century, African-Americans also began to migrate up from the south. While much of Chicago’s North Shore turned residential over the course of the 20th Century, Waukegan retained much of its industrial character. Located directly north of Chicago along the shores of Lake Michigan, Waukegan is the county seat of Lake County, Illinois. According to the 2013 Census estimate, the city is home to just over 88,000 residents. Like many cities that have succumbed to urban decay or industrialization, the city of Waukegan has initiated a revitalization of the lakefront. The plans include replacing the existing industrial areas with residential and recreational spaces. To date, many new restaurants have opened, buildings have been renovated, and the City of Waukegan has made substantial investments in the pedestrian areas and other infrastructure. Residents and visitors to Waukegan can enjoy ArtWauk which is held on the third Saturday of every month in the Art District of downtown Waukegan. ArtWauk features paintings, sculptures, films, dance, theatre, comedy, music, performance art, food, and pedicabs. Each year, the Fiestas Patrias Parade and Festival also takes place in Downtown Waukegan which highlights and celebrates the independence of the many Hispanic countries that are represented in Waukegan. Although Waukegan has traditionally been a strong industrial town, the arts are also well represented by things such as the Genesee Theatre, the North Suburban Symphony, and Great Lakes Naval Museum. The attorneys and staff at Hedeker Law are proud to be active members of the Waukegan community and to call the residents of Waukegan our friends and family. We firmly believe that our ties to the community and the people of Waukegan allow us an advantage when helping clients with their estate planning needs. Given the importance of your estate plan, we understand that choosing the right attorney to assist you is imperative and we would be honored to be that choice. Creating your estate plan will be one of the most important endeavors of your lifetime. Once your estate plan is in place, it should do must more than simply dictate what happens to your assets when you are gone. While creating a plan for the distribution of your assets is part of a comprehensive estate plan, a well thought out plan should also help protect and grow those assets while you are here as well as ensure that they are available to provide for loved ones in the event of your incapacity or death. Furthermore, as you move through the various stages of your life, your estate plan should be reviewed and revised to mark those stages and the additional estate planning goals you likely acquire as well. For example, when you marry or become a parent for the first time, you should take the time to update your estate plan to include your spouse and/or child. You may also wish to incorporate new components into your plan, such as incapacity planning and probate avoidance. Hopefully, the value of your estate will grow along with your family, prompting the need to include asset protection strategies into your plan as well. Once you have a well-established family and career, you should begin to focus more on the future by creating a retirement planning component within your estate plan. As you get closer to actually retiring you will also want to discuss the need for Medicaid planning and funeral planning with your estate planning attorney. The highly personal nature of estate planning means that there may be additional, less common, goals and objectives that need to be included in your plan such as special needs planning or business succession planning. At the Waukegan estate planning firm of Hedeker Law, Ltd. we know it can be difficult to discuss deeply personal, and often sensitive, estate planning issues with a stranger, It is for this reason that we strive to create lifelong relationships with our clients that allow us to help protect you, your assets, and your loved ones both now and in the future. If you have additional questions or concerns regarding estate planning, or you are ready to get started on your plan, contact the Waukegan estate planning attorneys at Hedeker Law, Ltd. by calling (847) 913-5415 to schedule your free consultation.